Research Team: Elena Ojea (PI), Alba Aguión (PhD student), Iratxe Rubio (PhD student), Diego Salgueiro (PhD student), Elena Fontán (Master student). Research Team: researchers from Brazil, Chile, Colombia, Spain, Mexico, Portugal, Peru and Venezuela. Research Team: researchers from Spain, Portugal, and France. 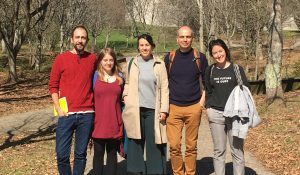 Future Oceans Lab is currently hosting the ERC Starting Grant funded project CLOCK (October 2016–October 2021) lead by Dr. Elena Ojea in the University of Vigo and in collaboration with the Basque Centre for Climate Change (BC3, Bilbao). As climate change impacts become more and more important for resource management and sustainable livelihoods, this research project aims at anticipating solutions for climate change. It focuses on spatial impacts over fisheries around the world, that are already changing their stocks distribution, and explores the best adaptation options for nature and society. 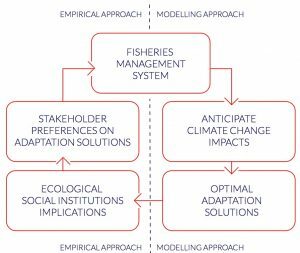 The overall aim is to design and develop an adaptation framework (figure 1) that integrates fisheries management science within the context of socio-ecological systems to assure long-term sustainability of the resources and livelihoods. – To help introduce fisheries adaptation at the top of the regional and international adaptation policy agendas. Case studies look at fisheries operating at various scales, from small scale fisheries in Galicia, to international tuna fisheries in the Basque Country, to quota operated European stocks and conservation areas in the Caribbean. Looking at different systems that are governed by a different set of rules and institutions is needed in order to obtain a global adaptation framework that can be operationalized. CLOCK approach combines modelling and empirical methodologies. 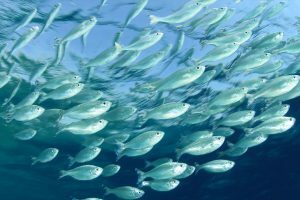 It combines bio-economic modeling of fisheries together with stakeholder-based empirical approaches. 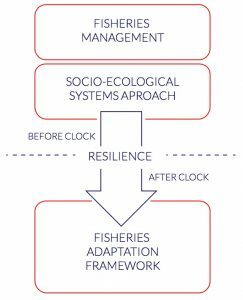 As shown figure 2, CLOCK starts by looking at fisheries management systems to incorporate the impacts of climate change and derive de optimal adaptation solutions. Then, these solutions are tested empirically and lessons learnt are incorporated to fisheries management. The motivation for this project is the undergoing impacts marine ecosystems have shown already due to climate change around the world. 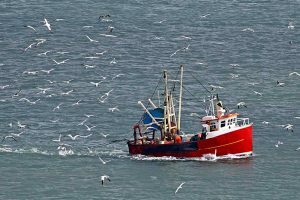 Recent studies have been pointing to relevant changes such as fishing revenues, influx of migrant fishers, increased costs per unit effort, higher insurance costs and changes in international fishing agreements. These impacts might jeopardise the fisheries and its dependent human livelihoods. Among the set of impacts that are expected from climate change, CLOCK focuses on spatial changes due to species shift in distribution. A future with stocks displaced due to changes in abundance and distribution of important species for fisheries and conservation may compromise current approaches to sustainable management, such as marine reserves or property rights, as well as ongoing institutional arrangements. In this context, new questions concerning sustainability, access to resources and equitable sharing arise. CLOCK will address these questions using a bottom-up approach that will provide new solutions to adaptation to climate change in marine systems. CLOCK is advised by a group of renowned international experts. Professor of Environmental and Resource Economics at the Bren School of Environmental Science & Management, UC Santa Barbara. Dean of the Bren School for Environmental Science and Management (UCSB, and Professor of Marine Ecology UC Santa Barbara. 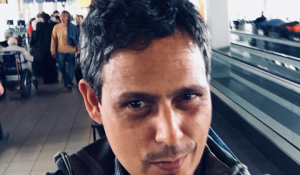 Ikerbasque Professor, former director of the Basque Centre for Climate Change (BC3) and Professor of Environmental and Resource Economics, University of Bath. New job offer for one research assistant on Adaptation to Climate Change in Marine Systems. 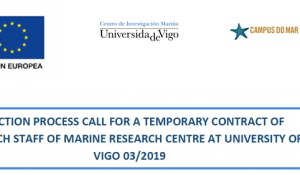 UVIGO Marine Research Centre (CIM-UVIGO) of the University of Vigo offers a temporary position to support the research line on Sustainable exploitation of marine resources.